The cloudburst-induced flood in Uttarakhand was a disaster waiting to happen. The state’s draft action plan on climate change is full of such warnings. A prudent document, it captures vulnerability assessments on Uttarakhand, people’s perceptions of climate change and how they are getting affected by the change. The document is also a comment on the development model in the state and raises several points about how development should not be done in an ecologically fragile region. The draft plan also gives a long list of activities that the state has planned or is planning to make its people more resilient, but it is a case of too little, too late as far as the current floods are concerned. 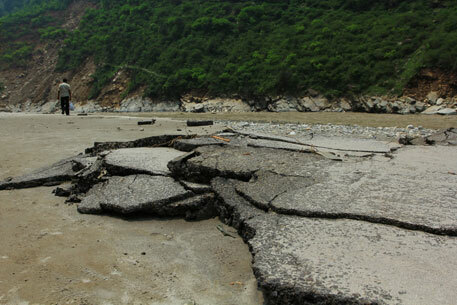 Uttarakhand has been a story of droughts, landslides and floods. In 2008 and 2009, the state experienced severe drought conditions. In 2010, people had to grapple with floods, flash floods, landslides and cloud bursts. Little wonder that the draft plan says “Uttarakhand is most vulnerable to climate-mediated risks”. The document cites instances of receding glaciers, depleting natural resources and erratic rainfall to reinforce this point. These are accompanied by more indicators such as irregular winter rains, changes in flowering pattern and drying up of perennial streams that point to a change happening in the hill state, some that people have observed (see box: people’s perceptions). And these changes have large-scale impacts. For instance, changes in monsoon are a clear food security threat. Uttarakhand receives about 90 per cent of its annual rainfall during the monsoon season. Even a 20 to 30 per cent change in the monsoon pattern can significantly affect food productivity, says the draft plan. It further warns that climate change will “significantly alter” hydrological systems, erosion and sedimentation in the region, besides causing more floods, landslides and damages to the landmass. In fact, flooding will increase between 10 and over 30 per cent of the existing magnitudes, which will impact existing infrastructure. What the draft plan anticipates will happen in future is already happening—the 2013 floods have washed away 19 hydropower projects. Wait, is it all just climate? Another official, former chief secretary of Uttarakhand R S Tolia, agreed that the devastation in Uttarakhand can be attributed to man-made factors. “It is not restricted to the June 16 cloudburst. How you are building roads, matters. If it were just a natural calamity, you would not see so much damage,” said Tolia. Jai Raj, additional principal chief conservator of forests and the nodal person in charge of the State Action Plan on Climate Change also emphasized that it is time to re-examine the development model. “Blasting to make roads, for instance, is a practice that needs to be stopped. We must employ environment friendly technology to build roads,” said Jai Raj. Roads, a symbol of development, have also caused the state more harm than good (see box). Road construction in the state has caused deforestation and soil erosion, leading to uprooting of large trees; disturbance in geological strata, disturbances in water resources, impacted biodiversity, caused pollution and destroyed medicinal wealth, according to the draft state action plan on climate change. The document also claims that the public works department is aware of the implications of climate change and is committed to taking steps to minimize the environmental footprint of the roads sector. If the plan is cleared, new road construction may happen after an environmental impact assessment and geological investigations and without blasting operations. Or, so one hopes. To undo these damages and ensure they don’t recur, the future needs to be planned with caution and the draft plan lists several initiatives to ensure “resilience to extreme weather events”. Broadly, the initiatives the state government wants to undertake include a low carbon development strategy, integrate climate concerns in all aspects of development and build a climate resilient development model. How this will be achieved remains a big question. For instance, to increase resilience, the plan aligns itself with the National Mission for Sustaining the Himalayan Ecosystem, which is one of the eight missions under India’s National Action Plan on Climate Change. The reality is the mission, despite being around for five years now, is focused only on capacity building without producing any results. Besides, to implement the activities, where will the money come from? After a state action plan is finalized by the state government, it is sent to a national steering committee chaired by the secretary, ministry of environment and forests, for approval. The steering committee then “recommends” the plan to Planning Commission where costs and budgets for activities are allocated to the state government concerned. “Implementing the plan in spirit is difficult and requires huge effort and money, which is still a big question mark,” says Sunder Subrmanian, independent adviser to the government and a consultant with UNDP, who worked on Uttarakhand’s state action plan. He added that the state government would have to take recourse in its own budget to implement the activities. But Jai Raj is confident that the Centre will bear the additional component. “Any additional component will be borne by the Central government. Let the plan get approved first, and if there are any changes, at least we will have a guideline for revision,” said Jai Raj. It is still not clear by when the plan will be approved (Jai Raj expects it to happen soon). What is clear is that if the state does not reexamine its model of development, stories of disasters in the hill state will become commonplace. For if the current flood situation does not act as a wake-up call to plan differently, nothing else will. Very critical analysis. Yes. The Government should be alert and should take all precautions so that such calamities won't recur. It is not the raising donations from people to help the victims of such disasters that is expected from Government but long term holistic plan keeping in view the ecological and economic aspects of the development of the region.